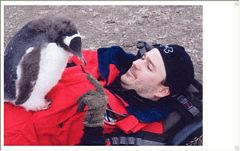 Tonite we had a report on Mike Darling's Antartica trip. As you can see from this picture he made very good friends with the local wild life. Isn't that baby cute! The new VereCare instant messaging and online support is in the works to be released as an added benefit for all gold suscribers and vereconference owners. I'm just posting the mp3 of this web conference updste. I haven't quite figured out how to edit the new recording so iframes don't mess it up. As soon as I figure it out you will have the full recordings again.